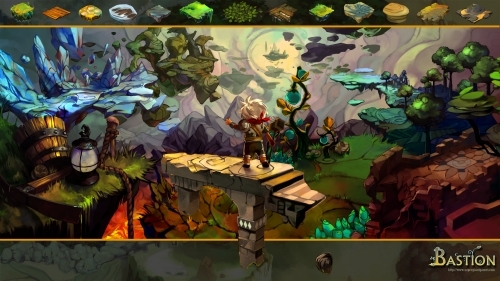 On this installment of Mood Pieces I’ll take a look at Bastion, an very atmospheric action RPG by Supergiant Games that’s available in Xbox Live Arcade, as a downloadable game for Windows in various stores, and for Google Chrome as a browser game(!). 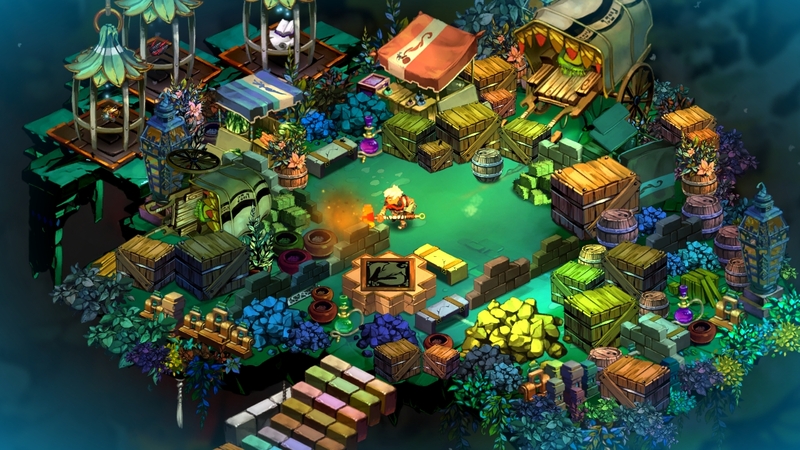 Bastion is one of those games where the ingredients list on the box doesn’t really whet my appetite: a downloadable, isometric action-RPG with cutesy big-headed Japanese style characters, where a single hero saves the world after an apocalypse. After games like LIMBO I’ve grown to distrust the initial meh-reaction to game types I traditionally don’t like, and in that regard Bastion really paid off. The gameplay indeed is what it said on the box: the player controls a single character who zaps around the game world killing monsters with melee and long range attacks, improving his weapons, fine tuning his weapons and attributes. What sets Bastion apart is the stunningly atmospheric and skillful storytelling, the extremely beautiful soundtrack and the weird faerytale-like art direction. So, once upon a time there was a city of Caelondia, which met with the Calamity – a massive catastrophe that fractured the city and maybe the whole world. The main character is called simply The Kid. He makes his way to the Bastion, which is a kind of a safe heaven in case of catastrophes, where he’s met with an old man, who’s the narrator of the story. The Kid sets off to a quest to find the power cores that powered the city, whose inhabitants have been turned into ashy fragile statues. The story is told by the old man, and the main character is totally silent. The old guy, however, comments on The Kid’s progress with a Western like drawl, drama and slightly sardonic wit. There’s a distinct feeling of listening to a story that’s told after the fact, in a captivating present tense. The voice actor is doing a brilliant job, as are the writers, in bringing surprising amount of depth and life to the game world, that in the end is not that expansive or expressive in itself. There’s a gimmick to Bastion’s level design that works really well in the context of the game’s story. When the player arrives to a new level (by unceremoniously belly-flopping on the ground after a flight on a Sky Bridge), only a small part of the level exists around him. When the character moves, pieces of the world start falling in place around him, starting from the ground up to furniture, items and monsters. This works really well in conjunction with the story of the world fracturing Calamity. The levels and the enemies are beautiful, and just varied and weird enough to keep the sense of discovery alive. The gameplay itself works really well. Bastion is not exactly fantasy, since the character can pick up such weapons as muskets and dual dueling pistols, which gives the game a nice New Weird vibe. Combat is fast and fun, but requires some amount of tinkering with the stats of the weapons and the main character, that’s done in a simple yet satisfying way. And the music. Oh yes. Like the drawl of the narrator, the music has a distinct Western vibe to it, mixed up with a better variety of “fantasy-folk”. 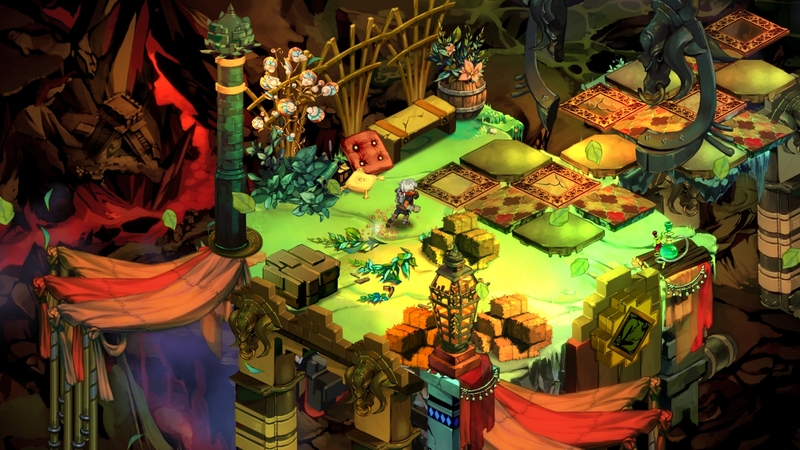 Even with hack’n’slashy action RPGs aren’t usually your cup of tea, give Bastion a try. If you want just to relax and enjoy a story, the game supports that too – it has a story-mode where dying doesn’t set you back, only earns you a wry comment from the narrator.